Bennett's Valley Ambulance Assoication Inc.
Bennett's Valley Ambulance provides Emergency Services to three municipalities. Huston Township in Clearfield County and Jay and Benezette Townships in Elk County Pennsylvania. Yes we have lots of Elk and Deer. We provide Emergency Services 24 hours a day seven days a week. With a special focus on rural/wilderness emergencies we must be ready for anything and take great pride in our ability to meet community needs. This is the new station and we are very pleased how it turned out. 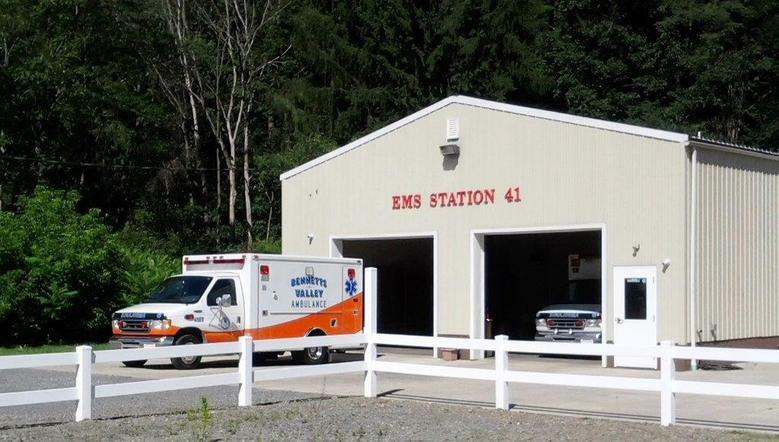 We are located at 12479 Bennett's Valley Hwy, Penfield Pa.
We still have work to do outside and on our driveway but the most important part is done thanks to so many people that realized the importance of EMS. Bennett's Valley Ambulance Association Inc. The Best In Rural EMS! Providing Emergency Services to over 238 square miles in the Mountains Of Central Pennsylvania. mission and why we are asking for your help . We know times are hard but someone still has to be ready to answer the call for help. With your support we can continue to provide quality Emergency Services in our 238 square mile service area. The money you donate will help save lives and it don't get any better than that. Dedicated to God, Country, and Community Service. Please make check or money order out to: Bennett's Valley Ambulance Association. All donations are tax deductable . Bennett's Valley home of the most popular Elk viewing area in Pennsylvania, Winslow Hill. Parker Dam State Park viewed by many as the best park in the state and theirs more! Just some of the reasons EMS is so important to the area. As I perform my duty, Lord. Whatever be the call. Help to guide and keep me safe from dangers big and small. I want to serve and do my best, no matter what the scene. I pledge to keep my skills refined, my judgement quick and keen. This calling to give of myself most don't understand. But I stand ready all the time to help my fellow man. To have the chance to help a child, restore his laugh with glee. The praise of men is fine for some, but I feel truly blessed. That you, Oh Lord, have chosen me to serve in EMS.